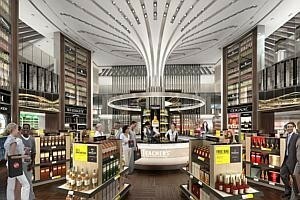 TRAVEL retailer DFS is spending $85 million to overhaul its liquor and tobacco duty-free concessions at Changi Airport as it introduces new concepts at its stores in existing terminals and the upcoming Terminal 4. With an additional 10,000 square feet of space in T2 and 20,000 sq ft to come from T4 when it opens in 2017, DFS' retail footprint for liquor & tobacco concessions will grow to 85,350 sq ft.
Aside from new duplex stores at T2 and T3, DFS will also offer an extensive selection, which will include Asia's biggest assortment of single malt scotch - such as Mortlach - as well as a sizeable collection of wine from key regions. Meanwhile, in a tie-up with the iconic Raffles Hotel, DFS will introduce the Raffles Long Bar experience at T3. In addition, DFS is establishing a members' lounge in both T2 and T3 - a first at an airport for the group. "Compared to other airport upgrades, Changi is by far our most ambitious ever," said DFS chief operating officer Michael Schriver. The revamp is part of airport operator Changi Airport Group's (CAG) efforts to enhance the retail experience at Changi as other airports in the region expand and upgrade their facilities. Aside from competing with other airports, Changi is also competing with other retailers and shopping destinations for spend, pointed out Lim Peck Hoon, CAG's executive vice-president (commercial). The updated DFS stores at T1 will be ready by December this year, while the new concepts will be rolled out at T2 and T3 by 2016 and early 2015, respectively. A long-time tenant at Changi, DFS recently won the right to continue running the liquor and tobacco concessions in a hotly contested tender. Its existing contract is for six years. Last year, overall concession sales at Changi Airport jumped 9 per cent year-on-year to reach a record of over $2 billion, with sales of liquor and tobacco accounting for over 20 per cent. Commenting on the growing proportion of budget travellers at Changi and whether that could hurt revenue, Mr Schriver said the country of origin tended to be a better indicator of spend than the type of airline used. "When the budget terminal still existed, it was the highest spending terminal of the four at Changi," he added. T4 is being built on the site of the former budget terminal. In a separate release yesterday, CAG announced that ANA Cargo was launching a new freighter city link, Okinawa, to Singapore. The Japanese freight carrier, which has relocated its Asia cargo office from Hong Kong to Singapore, will operate six weekly Okinawa-Singapore-Tokyo Narita services.